This is the Best family park I have seen in North Florida! Nearly brand new it is situated on Big Sand Lake. The park features a very large splash park with two areas, a smaller children's area with computerized water jets coming out of the concrete, and the big kids area with water cannons, and sprinkler tunnels and more. 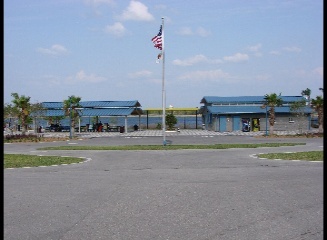 Large shaded bimini canopies cover the picnic tables inside the splash park. The splash park has a small fee. They charge every day in the summer time for the splash pad. It is $1 per person per session. They have a 10 am until 2 pm session and a 3 pm until 7 pm session. They close everyday from 2 to 3 pm. There is a large restroom facility, and very large covered picnic area overlooking a large grassy field in front of the large stage area. On the opposite side of the splash park is a state-of-the-art children's playground, with unusual, one of a kind, futuristic playground equipment I have never seen before. The base of this very large playground is soft foam to ease any falls. The playground also has giant bimini canopy shaded areas over the picnic tables throughout. There is a cement walking/biking trail around the whole park, and on the lakefront. Volleyball nets on sand are directly next to the playground area. They have covered picnic areas with grills next to the lake. This park is simply outstanding. Very nice job! Come see this hidden gem!